I confess I have a bit of a fascination for all things medieval. I usually read a couple of books each year set during that time. So it's no surprise, really, that I'm always hoping to get the boys to play knights and castles. The boys received some knights and dragons for Christmas, but we were missing a castle. So I decided we would build one, out of craft supplies we had around the house. 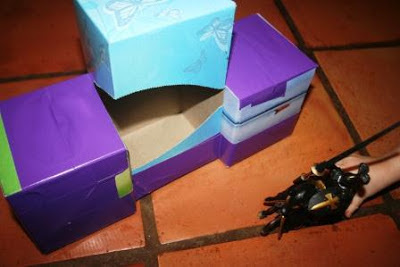 I used purple duct tape to join together 3 tissue boxes - one long box and two smaller boxes. I thought briefly about spray painting the ensemble, but then decided we could have a purple castle. I made flags from toilet paper tubes and foam sheets, and also made a moat complete with frog and fish stickers from foam. Then I cut doors and windows. 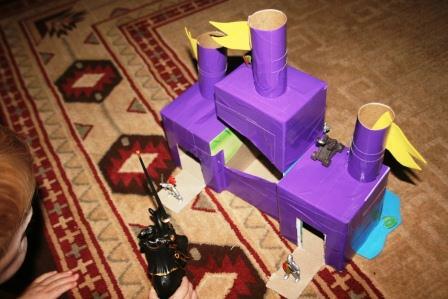 Here is the back view - the knights can go in the doors in the back of the castle and peek through the windows. The boys are enjoying the addition to their knight and dragon collection. Maybe next we'll creat a dragon's lair to hide our dragons in. After castle creation was complete, we read a few books to help with our creative play. How about you, readers? Do you remember reading books as a kid and then reenacting them in play? This post linked with Read, Explore, Learn at JDaniel4sMom. Neat idea, and clean. I recall making mud castles in the back yard and using the silverware to dig the moat. absolutely I was reenacting stories, snow white and all! I want to play with that castle !!!! Very cool !!! This is just great! You're such a great Mom! Excellent idea Lisa. I did not do this as a child, but we have tried to create imaginative playthings as parents. It is amazing how much fun an old refrigerator box can be for little ones. What a GREAT idea Lisa! The boys have got to think you are the best Mommy EVER!! The only castles I tried to make were sand castles and that didn't work out so well. I love the purple castle! You are such a creative and fun mom! I acted out scenes from the books I read with Barbie dolls. I made a house boat out of a cigar box one time, I remember. I remember re-enacting some great stories when I was a kid. This is such a cute idea! You will be so ready for the tissue box challenge. I am going to share this post on the Read.Explore.Learn. Facebook page. WE adore all things medieval at our house, too. Very clever castle building. You did an awesome job on the castle! This is a great idea! We recently used all of our boxes from Christmas to make a castle. The kids loved it! This is a brilliant idea, I LOVE it! And it is also really pretty with the purple. You should be looking for a job as an architect, ha ha ha. I remember having a castle shaped birthday cake when I was five or so. I love it when kids are inspired by books-there is nothing like a good story to get the imagination going! Lisa! hi! What did I tell you about you being a great Mom to your boys? ...that ...you are one! This is so dang great and cute. I will have to tell my daughter that has a son about this.....yes! Hahahaha.... there is even a moat around it. I didn't see that on my first visit. Good job! hey Lisa! Oh that is nice to hear, thank you; you remembered a thingy about me. That is always super fun to hear. Really creative and no doubt the boys loved it. I don't remember doing that when I was little but my girls totally do. It is the cutest thing to watch. 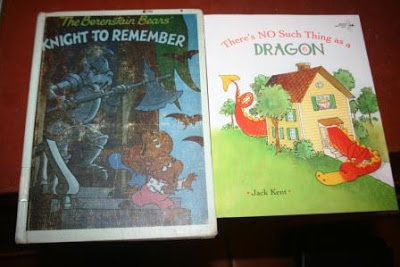 Books help imagination so much, I feel kinda jipped as a kid for not being a reader. 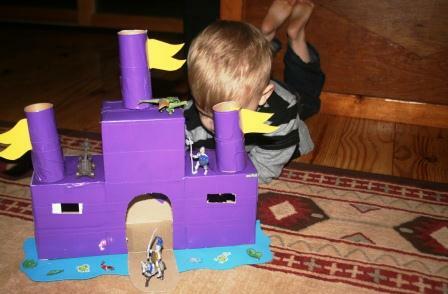 What a brilliant idea to build your own castle, it looks very good :) Enjoy your weekend. and hey, your fascinationg with midievel things is probably better than my lifelong reading of Vampire material..lol.. I am a twilight fan, and yes, I'm embarassed to admit that. That is awesome with the duck tape - Andy has to make a diorama on his book - you are really teaching your children well! So cute! And yes, I remember doing things like that. How creative! My husband loves all things medieval as well so he'd probably like to play with this too haha. That is too cute! I love it! :> I love castles, real ones. They're beautiful. You need a refrigerator box....that's what we would do when we read books that we'd act out. We'd get a box and make it our castle. You guys did a GREAT job with the castle!! Very creative!